Cape Kiwanda State Natural Area is a state park in Pacific City, Oregon, United States. Cape Kiwanda is on the Three Capes Scenic Route, which includes Cape Meares and Cape Lookout. Hiking to the top of Cape Kiwanda allows views of Nestucca Bay to the south and Cape Lookout to the north. A sea stack, named Haystack Rock, is located 1⁄2 mile (0.80 km) southwest of the cape. It is one of three features along the Oregon Coast that are called "Haystack Rock," though the one in Cannon Beach is more widely known. One of the attractions, called the Duckbill, in the park was destroyed by vandals in August 2016. 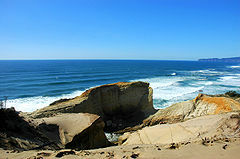 ^ "Cape Kiwanda State Natural Area". Geographic Names Information System. United States Geological Survey. Retrieved 2011-06-25. ^ "Features named Haystack Rock in Oregon". Geographic Names Information System, U.S. Geological Survey. Retrieved 2011-06-25. Wikimedia Commons has media related to Cape Kiwanda State Natural Area. "Cape Kiwanda State Natural Area". Oregon Parks and Recreation Department. Retrieved 2011-06-25. 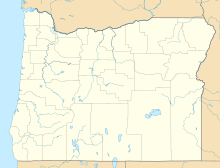 This Tillamook County, Oregon state location article is a stub. You can help Wikipedia by expanding it. This page was last edited on 21 March 2019, at 01:20 (UTC).